ILLUSTRATION, PAINTING COMMISSIONS, CLASSES AND MORE! 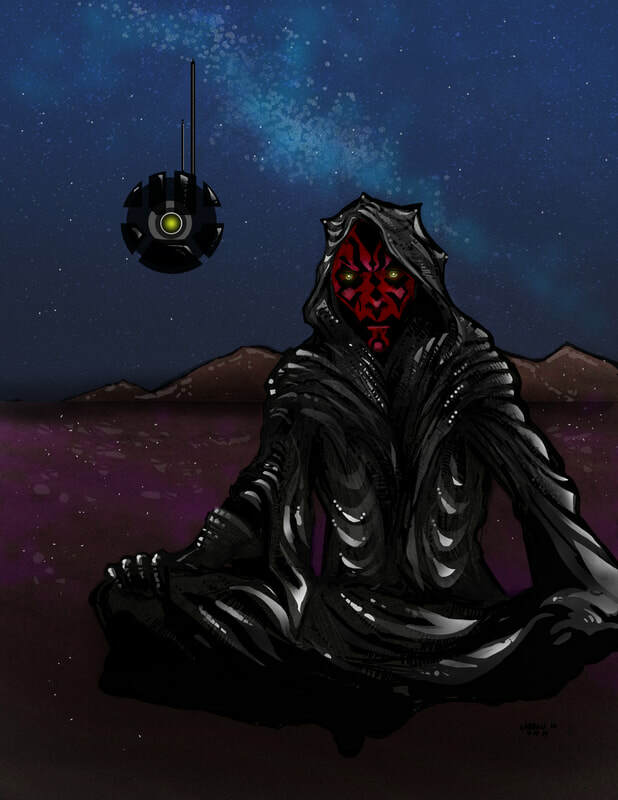 I just hadda try a Darth Maul.Click here or on image below for Blog and development pics. This is the beginning of a larger work, click each image below to see how each study developed. I do customized science fiction and fantasy paintings on demand, including LOTR, Robbie the Robot, Star Wars and other fantasy pop art projects. Landscapes, nature scenes and animal paintings are popular too, and I invite you to look at previous work HERE. Have an idea for a science fiction, fantasy, landscape or pet portrait? Click Here! Happy to talk with you about any painting you would like to see. Andy Carson has been painting, sketching, and doodling since about the Fourth Grade, and enjoys working with Acrylic, Watercolor, Charcoal and Pastel, and well as with Pen and Ink. He also likes using plain old pencils, and figures that even crayons will work in a pinch. He has attended courses at the Academy of Art College in San Francisco, as well as at City College of San Francisco. He has taught private lessons in the Noe Valley area of the city as well as at the Sharon Arts building in Golden Gate Park, teaching Acrylic, Watercolor and Basic Drawing classes and workshops. He has been a local working illustrator for over 20 years, doing illustration work and painting commissions, murals, comics, and even the occasional sandwich board or window display on demand. There have been random sightings of the elusive and mysterious Mr. Carson out in the Twin Peaks area of SF, reputed to be his new neighborhood of choice and present place of residence. It has been surmised by many that he also lives in a cave, hidden from the eyes of men in that same District, but will reportedly come out of it for commissions, a walk in the park and/or the occasional meatball sandwich. Each painting for me is a kind of adventure. I paint things that move me, and hope that some grain of truth about the world I see and know can be revealed within. I work and rework a painting until it finds me. I use color to evoke mood and essence, and strive to connect outer subjects to an internal impression, a world they leave me with. I find a tremendous sense of grace exists within the natural world, and wish to share these impressions with others, hoping they might find beauty there as well.